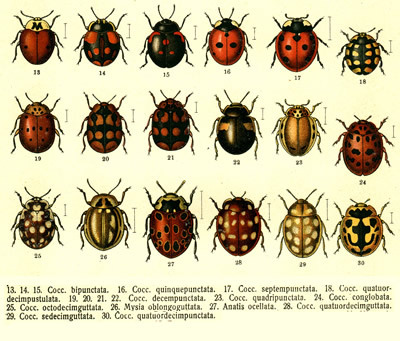 Did you know that some ladybugs have stripes and even other unusual markings? Some ladybugs have no spots while some have as many as twenty four. Some have stripes. There are about 500 different kinds in the United States and nearly 5000 world wide. They come in all different colors, too. Reds, yellows, orange, gray, black, brown and even pink. Below are a few photographs to help you identify these unusual "ladies".